It's the salty & sweet (peanut butter and jelly, pretzels in ice cream, sea salt on chocolate) that always stand out in the vast space of one note tastes. I love the salty & sweet approach when I design. It makes for a more interesting piece and eventually...a more layered and memorable room. 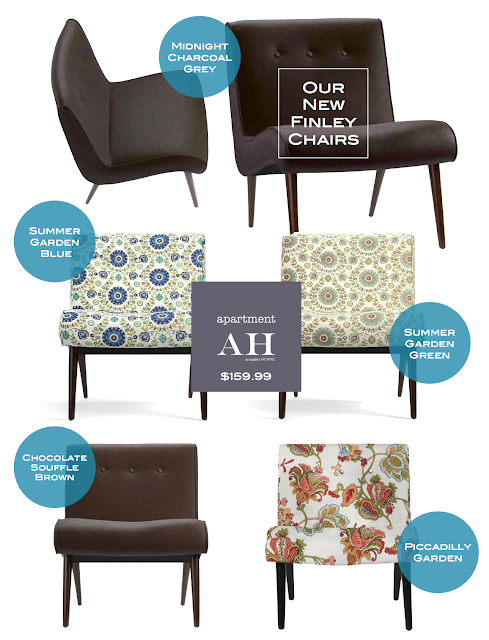 My NEW Finley Accent Chair, for the apartment AH collection, feels modern with all it's clean lines, three button back and sleek wooden legs. BUT it can also be partnered with traditional patterns that make for a swell style combo. The extra part to this combination, is the perfect finishing detail...A Great Value! Piccadilly Garden is my favorite.